Automatically downloads and installs print drivers (PostScript/PCL 5/PCL 6). 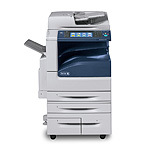 The free Xerox Global Print Driver manages Xerox and non-Xerox printers on your network with a single, easy-to-use interface. It dramatically simplifies enterprise printer management for IT managers, making it easy to add and update printers without changing drivers. Note: Please re-select your Operating System and Language choices after you are re-directed to the Global Print Driver web page. The free Xerox Mobile Express Driver lets you find and print to any PostScript® printer in any location from a single, easy-to-use interface, without tedious driver downloads and installations, or asking IT for help. It’s perfect for the mobile professional. The Mobile Express Driver is Xerox Digitally Signed. Note: Please re-select your Operating System and Language choices after you are re-directed to the Mobile Express Driver web page. Windows XP/Server 2003/Vista/Server 2008/Windows 7 32-bit PCL driver - WHQL Certified. Windows XP/Server 2003/Vista/Server 2008/Windows 7 32-bit PCL6 driver - WHQL Certified. Windows XP/Server 2003/Vista/Server 2008/Windows 7 32-bit PS driver - WHQL Certified. Windows XP/Server 2003/Vista/Server 2008/Windows 7. Note: Note: For ease-of-use Xerox recommends using the Automatic Upgrade method. The .zip file contains system software and installation instructions.